Now that all the hub-bub of Memorial Day and the 4th of July has passed us by, our outdoor cooking can take on a more leisurely pace. And for a nice, long, relaxing cookout, smoking a brisket is the way to go. If you're planning on serving a perfectly smoked brisket for lunch on Saturday, be prepared to fire up the smoker when the sun goes down Friday night. Yep, you heard me right. A ten to twelve pound brisket can take 12 hours or more to smoke, so by starting at nine or ten o'clock the night before, your brisket will most likely be done by noon the following day. For a Saturday brisket, you should buy one on Wednesday or Thursday. Get a whole packer cut brisket, the type that's wrapped in a tight fitting plastic wrapper. It will have a layer of fat covering one side. You'll be trimming that fat down to about 1/4 inch in thickness, so if you can, buy one that's not layered too thickly with fat. And if you can find a whole Certified Angus Beef brisket, you might consider getting one. I've found those to be a little more tender and flavorful. After getting the brisket home, it'll need to be trimmed and seasoned before going into the smoker. This is real hands-on work, kind of messy, kind of yucky. But it's gotta be done in order to have a great tasting smoked brisket. Once that brisket goes in the smoker, it's smooth sailing. Just keep the temperature at an even keel, and enjoy the moonlight...and then the sunrise. Nice and relaxing. Oh, and what I said about leisurely? If you're a sharp cookie, you'd know by now that I do my smoking (in summertime anyway) in my bare feet. 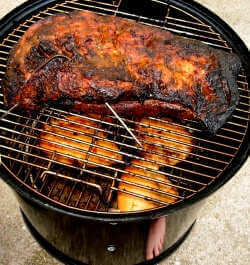 See the reflection in the smoker? I recently bought the book, Competition BBQ Secrets, put out by the Chatham Artillery BBQ Team and really liked what I read. It's chock full of information about barbecuing, with an emphasis on how to go about creating prize winning ribs and briskets. Heck, just finding out what the team injects their winning briskets with was well worth the entire price of the book to me! I highly recommend it. It'd make a really nice gift, too! The Whole Beef Brisket - EXPOSED! Whole briskets are made up of two separate muscles...and a whole bunch of fat. Good fat, that is! Even though all that fat is good fat...some of it need to be trimmed off of the brisket. A sharp knife and steady hands are all that's needed! After the trim job, a good coating of dry rub seasoning will give your brisket awesome flavor. Hit it twice and hit it hard! Decisions, Decisions! What Dry Rub Will I Use? There are lots of options when it comes to seasoning a brisket with dry rubs. Hot and spicy or nice and mellow, the choice is yours. Brisket Smoking 101. How To Smoke a Brisket. From start to finish, learn the ins and outs of brisket smoking. Buy the best, season it, and smoke it. Then eat it, of course!